Can malware or a virus on the remote system traverse the TeamViewer connection and infect the host system? Background: Helping a friend troubleshoot problems on his Windows 7 Home system, which may have malware or a virus, among other issues. He claims to have the latest, up-to-date Microsoft Security Essentials and a version of Malwarebytes with real-time protection. His system has TeamViewer (free for personal use), but I don't know the version. My W7 Pro system has the latest, up-to-date MSE and MBAM Premium (real-time protection), and the latest TeamViewer 14.1.3399 (free for personal use). Question: Can malware or a virus on his system traverse the TeamViewer connection and infect my system? I am working for a client that would like to leverage Windows Defender as their endpoint security solution. I would like to recommend a different endpoint security solution to them in favor of Defender. How would you make your recommendation to the team and what talking points would you focus on? Let’s say you’ve been successful in your recommendation and the client decides to implement the solution you pitched. About 6 months after you are done with the implementation, issues start to arise and the cause seems to be the endpoint security solution you recommended and implemented. The client is asking to have the issues resolved immediately, however the vendor is not being responsive or supportive, and has indicated they may not have a fix for the problem. The client is also alluding to wanting to move back to Defender. What steps would you take with the client to alleviate their concerns about your recommended product, and what steps would you take with the vendor to ensure prompt replies and a sense of urgency? What is a good tool to manage and centrally administer Windows Defender? 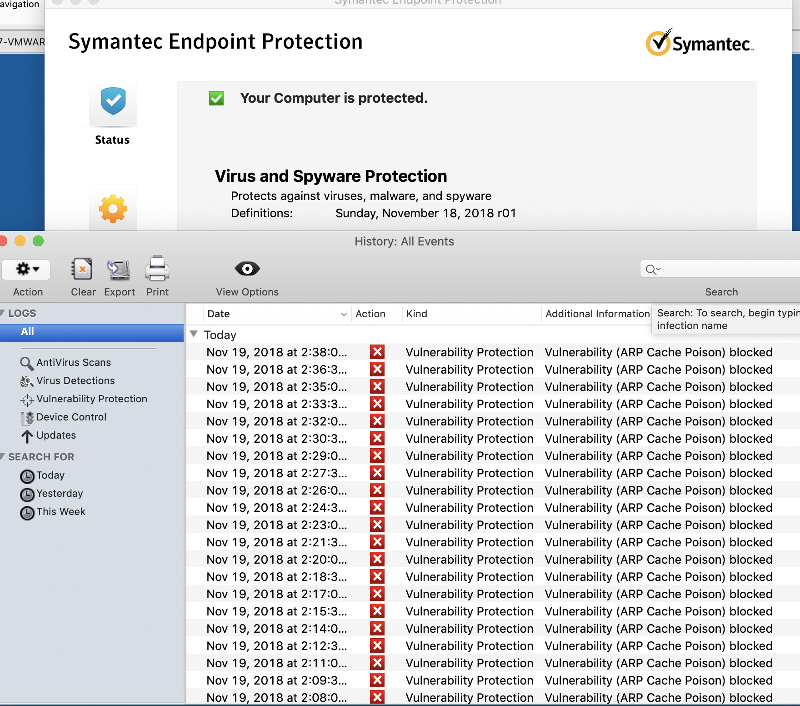 We have used Symantec Endpoint Protection for antivirus for the last 10 years. But now that Windows Defender keeps getting better and better (specifically the new sandboxing) I am considering abandoning Symantec. The reason we haven't been able to make the switch yet is that I need the central notifications, so that as the admin I know of every infection, and also need to verify that definitions are updating on all PCs. I once heard something about a third party package that uses the Defender engine but adds a management layer on top of it. What are some packages that do this? Any recommendations? We are having and issue with deleting computer profiles. This profiles are usually deleted during the nightly reboot and reloaded at logon. After a closer look, the issue is with a hidden log file in the profile for Avast. So I logged into one of the computers having this problem to troubleshoot it. Logged in with a admin account. Tried to take ownership so I can deleted it. All I have tested will not allow it. Never, had this issue before. This is one Windows 7 computers. to generate 2 values indicated by 1st value & 2nd value enclosed in "...' below. attached the full IOC file. A user was infected with the trojan.emotet and now my computers are constantly be hit wiht Artemis! Trojans through out the day. I have the McAfee Endpoint Security, which catches and deletes it. However, does anyone knows how I can get rid of this? Any help in this will be most appreciated. -what they should be able to produce in terms of compliance reporting for all their managed devices specific to AV. I will then use these to compare what they can produce from their central AV monitoring console(s) for a sample of devices or even all devices listed in other information sources such as AD, system centre or our asset management DB. I presume the 3 basics would be status (on or not), definitions last updated, last scheduled scan date. Are there any others? There seems to be an assumption AV setup/config/management is pretty hard to get wrong but from some recent health checks for PCI DSS I noted on the findings many issues such as out of date signatures, AV not even running in some cases on devices etc. Currently dealing with an Emotet Trojan on a domain network with around 20 machines. I know that the files replicates itself across the network and is generally a massive pain and is quite aggressive. Does anyone have any tips at all that I could use to try and eradicate the malicious code. I thought I cleared it by taking all machines offline and manually cleaning them by removing the files that were sat in SYSTEMROOT and user appdata etc. Any pointers would be really appreciated, also if there is any specific software that removes this Trojan, that would also be of great help. Is AWS' AV subscription now an agentless AV? Is this the agentless Deep Security? We are moving some of our apps/systems to the cloud. & that it's not applicable to install/run AV. enough. Or is there a script for me to verify? months in coming out with the patches. I have a client with a 2016 RDS server using a non-standard port (not 3389) for security reasons, which works fine. Can anyone help me get the remoteapps to work on the non-standard port? We're trying to delete a Symantec ccSettings .dat file but it won't allow us to. 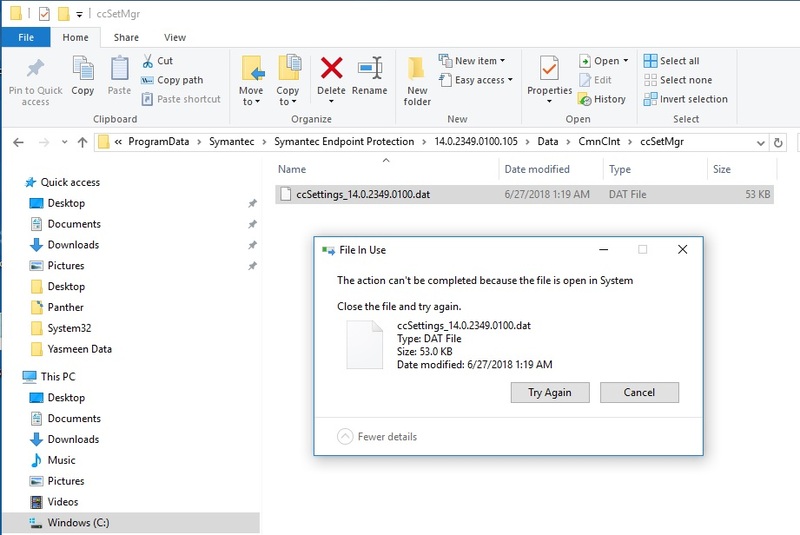 Keeps stating that the file is open in System. We've uninstalled Symantec, deleted all Symantec folders in registry, ran the SEP uninstaller, no change. Tried Unlocker and FilExile, no change. Turned off Tamper Protection in SEP, no change. Attached is a screenshot of the error. We currently have a case open with Symantec on this, but they seem stumped as well. Wanted to see if the good people of EE might be able to help! I would like to get some feedback on my security software assessment. I have Windows defender that comes with Windows 10 and Webroots Secure Anywhere through Best Buy. I also have paid professional versions of CCleaner and Malwarebytes but I am not using them currently. I can install them if I need to. I heard a lot of bad information about CCleaner and I am not sure if things have improved since those articles were written or not. My question to the experts is what I have at moment enough arsenal against all the bad "WARES" or not? I have been blessed so far and I had any problems. Please let me know if I need to install the CCleaner and the Malwarebytes or Spybot Search and Destroy? I know in life the more the merrier is not always true. If I did install the CCleaner and the Malwarebytes or Spybot Search and Destroy, what would happen to my PC? will it slow down or do all of them clash against each other. Please educate me. I don't have a Solaris box that internet facing. I want to know what are the experts recommendation to the best method to block the annoying ads in chrome Edge? It seems every time I visit a website medical, department store etc. I am being bombarded with heavy artillery of ads. It makes me not want to surf the web anymore. Please help.